11042 VAR GUINEA (1962) Croix Rouge. Capsule spatiale* cerclant autour de la terre*. Yvert No 168. Scott No 309. Centenaire de la Croix Rouge Internationale. 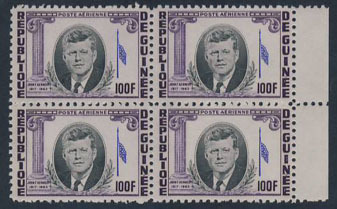 Superbe variété: omission de la couleur verte dans un feuillet de 20 timbres non dentelés. Le fond et le nom du pays manquent! **. 1561 VAR GUINEA (1964) Kennedy*. American Flag*. Error missing red color in the American flag. The flag has only the stars, no stripes! Scott No C56. Yvert No PA40. 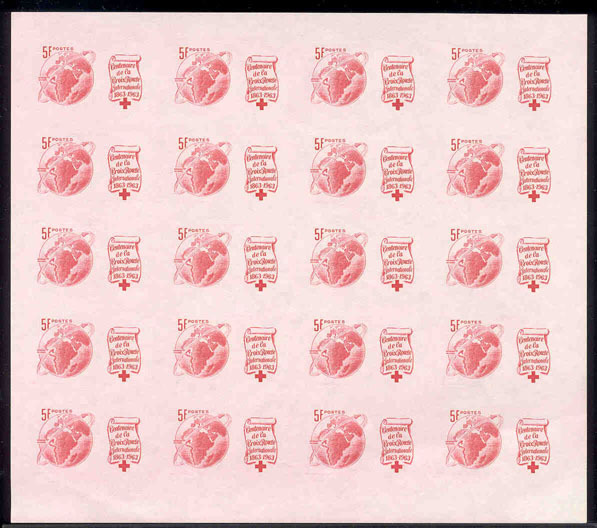 4522 VAR GUINEA (1964) J.F. Kennedy*. Variety with shift of the color red so that the flag is separated into 2 parts! Scott No 327, Yvert No 189. 4526 VAR GUINEA (1964) Kennedy*. American Flag*. Error missing red color in the American flag in corner block of four. The flag has only the stars, no stripes! Scott No C54. Yvert No PA40. 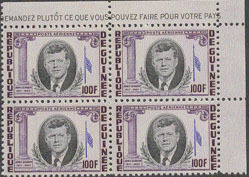 7520 VAR GUINEA (1964) Kennedy*. American Flag*. Block of 4, error missing red color in the American flag. The flag has only the stars, no stripes! Scott No C56. Yvert No PA40. 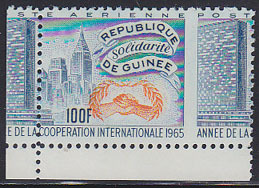 17785 VAR GUINEA (1965) UN skyline*. Handshake*. Vertical misperforation resulting in design shift by 1/3. Scott No C75, Yvert No PA56. International Cooperation Year.